Take The Unlimited Energy Now! Course. Does something feel missing in your life? Does it seem like no matter how hard you try, you just can’t find the energy to do basic things? Almost like something on a deep level is off right? Have you ever considered that maybe your energy isn’t low, it’s just blocked? How many times have you had random bouts of high energy for it to go away quickly? Maybe you feel good for a couple days after changing your diet, but then your energy goes right back into the toilet. You’re not strange for feeling this way! You may be poisoning yourself and you don’t even know it because it’s been made normal. So normal in fact that people experience it every single day! The difficult part is that most people ignore it….simply because they think they’re supposed to have low energy! Maybe you’ve thought this to yourself when you’re absolutely drained. What if it’s not normal though? What if you could train yourself to be energetic at will? What if you knew exactly what was blocking your energy? Wouldn’t you want to fix it? I’m Catherine Carrigan and I want to help you get Unlimited Energy Now! I have developed a course that will help you reclaim your natural energy so that you can have a leg up on the average person walking around. 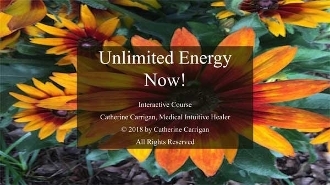 Abundant energy is so powerful and really gives you the connection to the universal source that you need to live a life fulfilled! It’s so unfortunate that the average person is drained. Some don’t know how to fix it. Whoever you are, this course will help you tap into the abundant energy of the universe that is your birthright! Click add to cart to get start now! You also get a *FREE* PDF copy of my Amazon bestselling book “Unlimited Energy Now!” to help you follow along with the exercises and questions that are asked in each section. There is also a $35 dollar off coupon for a phone consultation with me that you can use whenever you’d like! These bonuses alone give you 20% off the list price of the course! To get started claiming your intuitive powers today, simply click add to cart now! I look forward to hearing about your success and helping you find your intuitive gift!